As we all know, riding is a very extensive sport that requires many hours of commitment and dedication. For some people, like myself, it is a bit of a challenge trying to find time between riding and schoolwork. Last year I was struggling maintaining my grades while being in the AA horse show circuit. Recently I have found an easy way to balance these two, avoiding stress and maintaining a happy healthy state of mind. For me school always comes first. It took me time to realize this because I’ve never been one to necessarily enjoy school. What I discovered is that school is a lot like horse showing. You set a goal (upcoming horse show/upcoming test), you work hard and prepare yourself (lessons and training/studying), and then you take the hard work and put it to the test (competing/testing). As soon as I worked in school like I worked with my horses, I found that not only was it easier, but I also felt more motivated to learn and succeed in school. Now riding and school aren’t just about succeeding, but about learning. On numerous occasions I’ve worked extensively with a horse before a show, only to have them spook at a leaf on the ground and forfeit the distance to my first jump. Or I let one silly mistake overshadow all the good things about my round. Let’s try and relate this back to school: You’ve studied all week for your test and you’re looking over all your notes the night before and come to a vocabulary word you’re a bit hazy on. So you read it multiple times, drilling it into your memory. However, when the test gets passed out, you find that even though you spent hard time and work wrapping your mind around this word, it isn’t on the test. For me it is close to the same feeling; working at something that I’m not able to show others. When times like this come, it’s important to remember that we live to learn. Even though winning seems like the ultimate prize, it’s more about what the transition between what I knew before vs. what I know coming out. Sometimes things can get a bit overwhelming. Let’s say, having a huge project due on Friday and a horse show on the weekend. This is where the “school comes first” rule comes into play. When you feel stressed, your body doesn’t work as well as it does when you’re at ease. Meaning that your brain won’t be able to put out its best work. This is when I find talking to your trainer or parent can be helpful. Expressing to them how you feel and the problem at hand. Now, this doesn’t mean giving up the horse show. This could mean maybe instead of 2 divisions you do 1 division, or instead of the first week you do the second. A little communication can go along way. The main point I have been trying to enforce is that we have to work in school just as hard as we have to work in riding, if not more. Life is about setting goals and reaching them through determination. If you think about riding almost as reward for doing well in school, then maybe that could be motivation for you try harder in school. I know that works for me and I hope it works for you. At age four Alivia started training with professionals at least 5 days a week, 3-8 hours a day. Now that she is fourteen years old, she has amassed over 10,000 hours on horse back and has entered the show ring over 7,000 times. 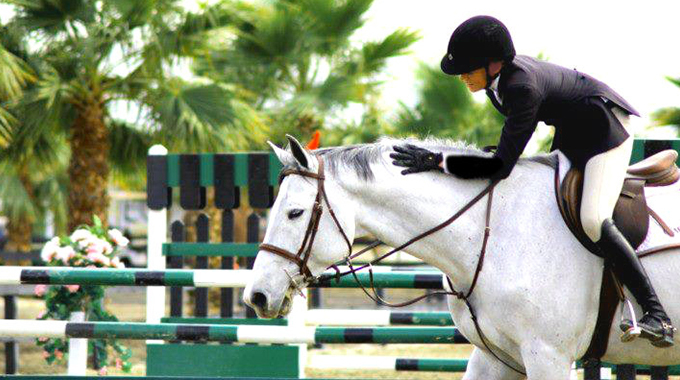 Alivia has had great success as a catch rider in a variety of horse and pony divisions and has won numerous championships at every major horse show in California. Over the years, she has worked with and been influenced by Olympian and Internationally acclaimed riders including John French, Bernie Traurig, and Robert Ridland. Her goal is to work hard and obtain a scholarship to a NCAA college and, hopefully, one day have her own professional business. 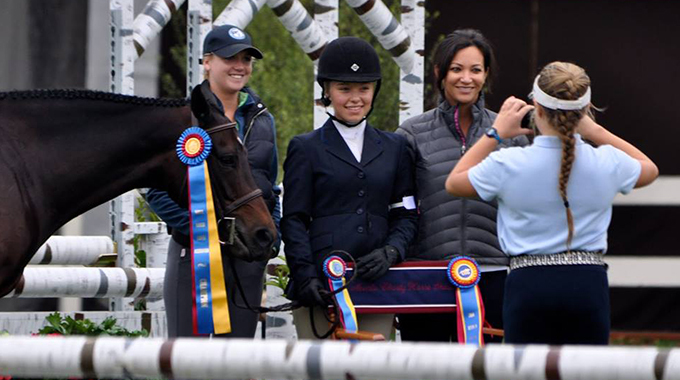 Junior rider Ally Worthington shares how her passion for the sport evolved after a chance clinic with Bernie when she was 10 and the challenges of balancing school, family and the competitive atmosphere of the country’s most prestigious shows. Very interesting and very well written, Alivia. Keep up the good work!